The Big Green Egg is a versatile outdoor cooker with features that set it apart from other grills. It's designed specifically for use with hardwood charcoal, which burns hotter than briquettes and adds a delicious smoky flavor to your food. The ceramic construction insulates the grill and allows the Egg to reach temperatures of up to 700 degrees Fahrenheit. However, the device has a draft door that allows you to regulate cooking temperatures to achieve the moderate heat that brats require. A beer bath adds flavor and keeps the brats moist. Replace the ceramic damper cover with the metal top that came with your grill. Fill the grill's firebox with hardwood charcoal. Light the charcoal using an electric starter or food-safe firestarter material, which is available at home centers and hardware stores that sell charcoal. Replace the cooking grate. Close the grill's lid once several coals are burning. Open the metal top to maintain air flow. Heat the grill until the thermometer reaches 350 F.
Place the brats and a stick of butter in a foil pan. 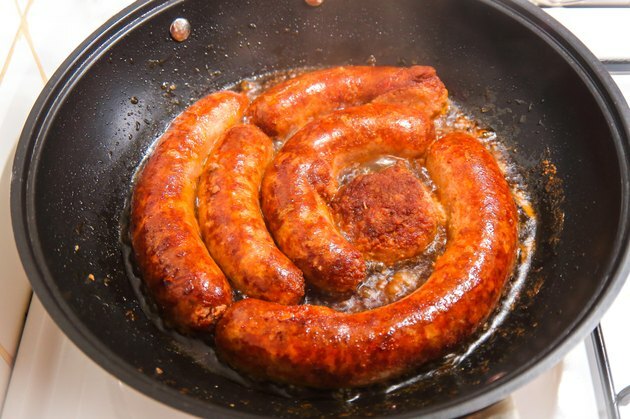 Pour enough beer into the pan to cover the brats. Place the pan on the cooking grate. Close the grill lid. Heat the pan until the beer comes to a simmer. Continue simmering for 10 to 15 minutes, or until the brats reach an internal temperature of 160 degrees F as measured with a meat thermometer. Use oven mitts to carefully remove the pan from the grill. Move the brats from the beer bath to the grill using tongs. Grill the brats just until they've browned on all sides. Return them to the beer bath. Reduce the grill temperature by adjusting the damper door and metal top. Less air flow means less heat. Return the foil pan to the cooking grate to keep the brats warm and moist until you serve them. For best results, grill the brats with the grill lid closed. Compared to fully cooked brats, raw brats require longer cooking time in the beer bath. Add flavor to the beer bath by simmering cooked and crumbled bacon, sauteed pepper and/or onion slices, or sauerkraut with the brats. Wear a long, heavy apron to protect your torso and legs from hot liquid spills. Opening the lid fully after the grill reaches a temperature of 400 F may cause the flame to flare out toward you. To reduce the risk of burns when you open the lid to check your food, start by opening it very slightly. Allow a small amount of air to enter. Wait a moment for any flare to subside before opening the lid the rest of the way. Never use lighter fluid to light charcoal in your Egg. The grill is made of ceramic, which can absorb lighter fluid's odor and cause it to contaminate your food.